While using the Hinge app, you may suddenly get logged out of the app while liking other profiles or chatting with a match. When you attempt to log back in to Hinge through Facebook, you may receive a login error message when you are redirected to the Hinge app. In some cases, you will repeatedly receive the login error message. The solution that has worked for most is to quit the Hinge AND Facebook apps on your mobile device (phone or tablet), then re-open the Hinge app and login in again. 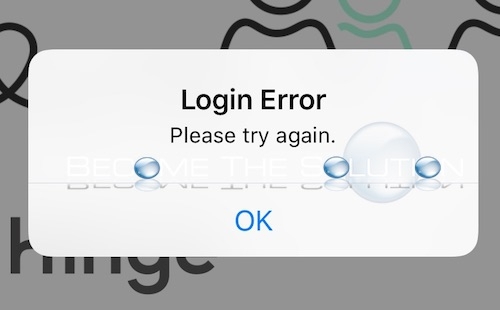 The error message should disappear and you should be able to login to the app again. If this does not work for you, there is likely an issue happening with the Hinge servers at that point in time and this is affecting the Hinge community. Use the comment form below to let us know if you are experiencing the issue along with others. Impossible to login in, shows error message. Same issues as those above. It kicked me off. I tried logging back in, but it said login error. I then proceeded to try my phone number, but it said the code it gave me was invalid and then later my phone number was invalid. I really enjoy this app, too! I can't login to my account, it still gives me the login error message. Can't log in to my account says my number is invalid.. I was logged out and when I was able to log back in everything had gone!!!!! Pls advise.. not a happy customer!! !